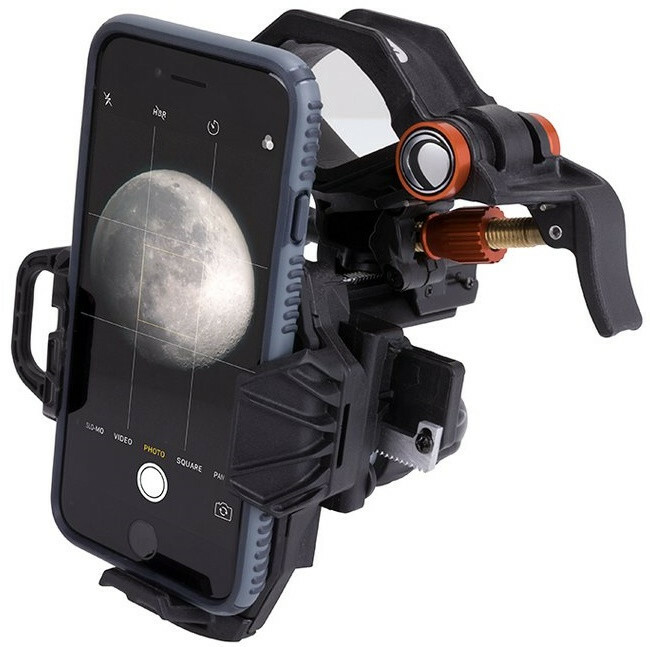 The Celestron NexYZ 3-Axis Universal Smartphone Adapter fits any eyepiece from 35 mm to 60 mm in diameter including telescopes with 1.25” and 2” eyepieces, spotting scopes, monoculars, and binoculars. NexYZ will also attach to microscopes with the addition of the included adapter ring, which takes the usable diameter down to 25 mm - the size of a standard microscope eyepiece. A strong spring and a threaded twist lock provide a two-level strong and secure grip on the eyepiece so you can use it with confidence. 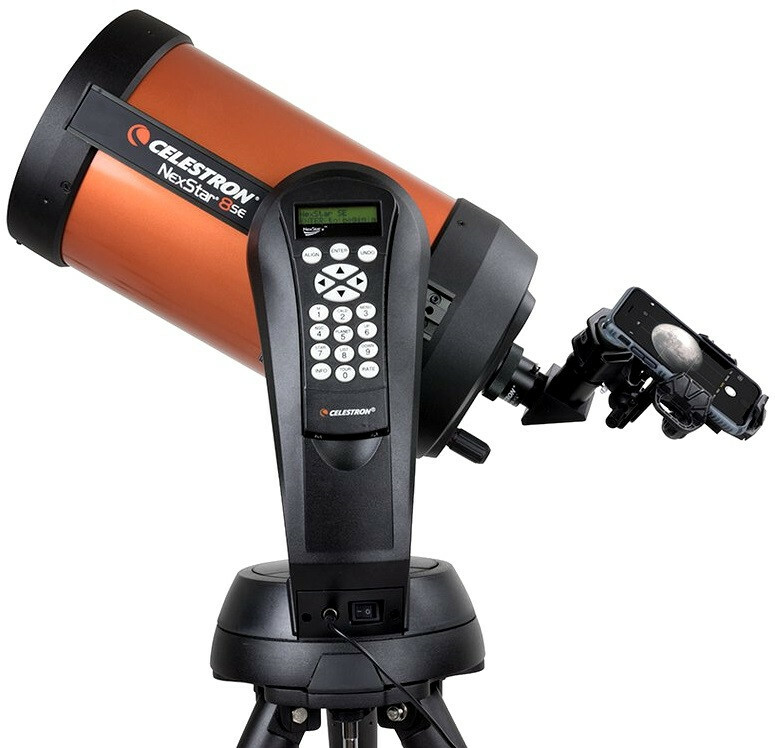 The Celestron NexYZ also accommodates a huge range of smartphones. 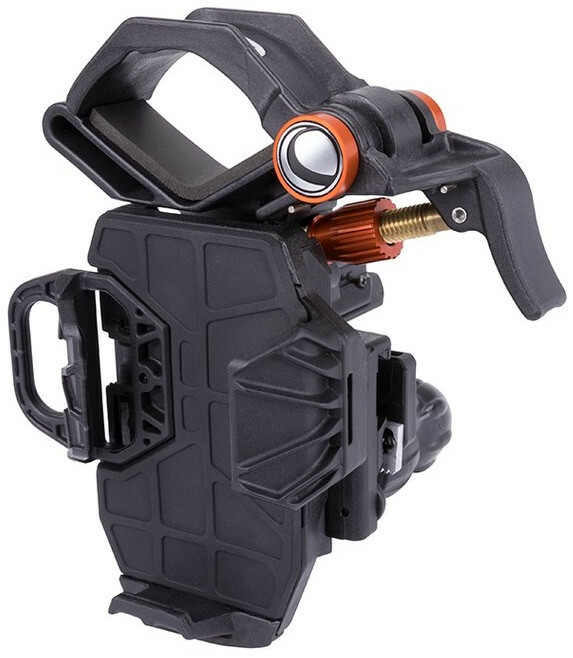 The phone platform is fully adjustable and can fit any device (usually with the case still on). Even larger phone/tablet hybrids like the iPhone 8 Plus and latest Samsung Galaxy devices work perfectly. The secure platform stands up to the weight of these heavier devices with ease. If multiple people want to capture a shot through your optic, NexYZ’s simple spring-loaded clamps make it easy to remove one device and replace it with another in seconds. NexYZ is the ideal solution for star parties and group bird walks where everyone wants their own shot of the action. Most adapters rely on you placing your phone perfectly on the platform offering limited adjustment in two axes. But NexYZ gives you the power to place your phone on the platform, center it over the eyepiece with the X and Y knobs, and then move up or down over the eyepiece until you have the entire field of view in your shot. Even though this adjustment is ultra-precise, it’s still quicker and easier than with other adapters. From start to finish, the process only takes about 30 seconds, including the time it takes to insert the phone into NexYZ, attach NexYZ to an eyepiece, start the camera app, and center the camera over the eyepiece using the knobs. If you switch phones, eyepieces, or optical instruments, you will need only slight adjustments to re-center the camera over the new eyepiece. You can also switch your image from portrait to landscape simply by turning the padded eyepiece clamp and readjusting the X, Y, and Z axis to realign your phone with the eyepiece. Squeeze the lever to open the clamp. Position the clamp around the eyepiece and release. Tighten the safety lock. Choose one of the two provided adapter rings that best fits your microscope’s eyepiece and secure it in place. (You may need to remove the eyepiece from the microscope to install the ring.) Then, follow the instructions above. NeXYZ works with regular phone cases, but you will need to remove “folio-style” cases. Extend the slider. Place your phone on the platform, making sure the bottom is touching the rubber base. Release the slider. Your phone is now secure and ready for imaging. Open your camera app. 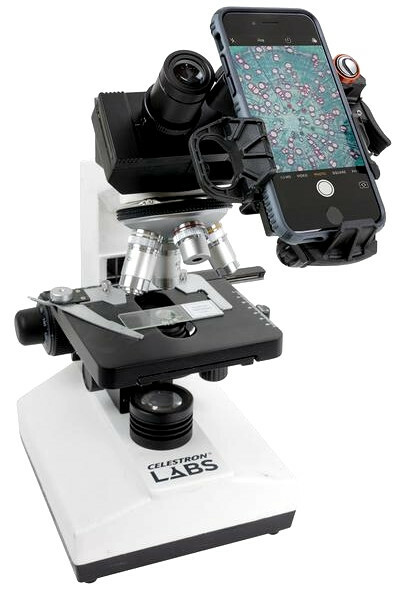 Position your phone over the eyepiece using the X and Y axis knobs. Then, use the Z axis knob to move closer or further away from the eyepiece until you have achieved your desired framing. Finally, adjust the focus using the focuser on your optics and snap the image. 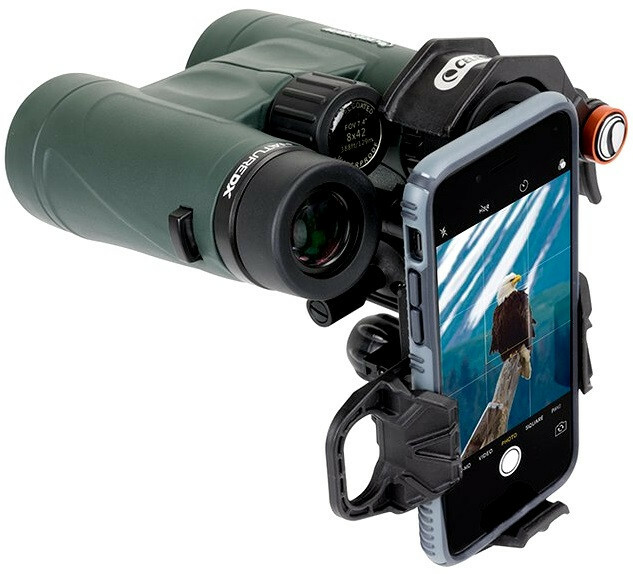 Please Note: The NexYZ fits telescopes, spotting scopes, binoculars, monoculars, and microscopes only. It is NOT for and will NOT fit riflescopes. 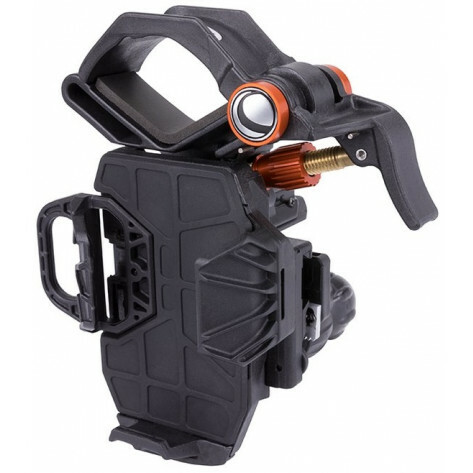 NexYZ will work with most phone cases, but if you have an especially large phone case with built-in batteries or a folio style case, Celestron recommends removing it for optimal use. Compatible Smartphones e.g. latest Samsung Galaxy devices; iPhone 8 Plus etc.